The eight-day visit is part of the China Australia Journalist Exchange program, organised by the All China Journalists Association and the Asia Pacific Journalism Centre, with support from the ANZ Banking Group. The journalists began their tour in Dalian in China’s northeast on October 18, where visits included discussions with Snowdragon Beef Co and the Municipal Government’s Development and Reform Commission. The team travelled by high-speed train to Shenyang, also in the northeast, where they will meet Austrade, provincial and local university officials. The tour concludes in Beijing on October 26. The China Australia Journalist Exchange program continues in 2015 with a visit by Chinese journalists to Australia. 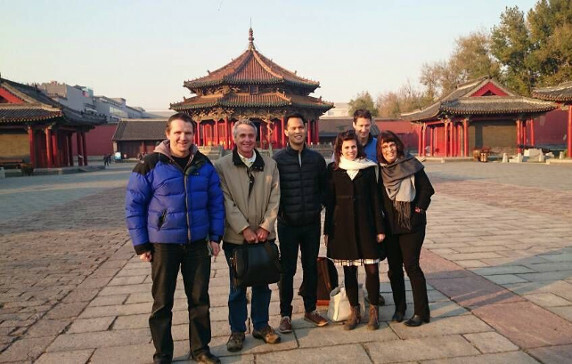 China Australia Journalist Exchange fellows visit Shenyang’s Manchurian Palace.